Have you ever tried to sleep with a fly or mosquito in the room? It’s just about enough to make you go crazy! Other noises that are just as bad are dogs barking two houses down, a noisy refrigerator, and the constant drip, drip, drip of water. Sorry, we can’t help with the neighbor’s dog, but we can help with the gutters and downspouts making too much noise after a rain. There are a few issues that could be causing your frustration. Here’s how you can solve them without replacing the whole system. Of course, if they’re dripping because they’re cracked, broken, leaking, or quite simply missing, then give us a call at 406-839-0084 and we’ll get new ones up for you. When the water flows from the gutters into the downspout, it transitions silently and flows off into the yard away from your foundation. But if the downspout completely vertical, and the water falls into it rather that flowing into it, it hits the bottom with a loud DRIP! A simple adjustment on the angle may be all that you need to make sure that the water gracefully slides onto the downspout and out the bottom. If there’s no way to adjust the angle, then you need to take a different measure. You need to soften the blow when the water smacks against the transition at the bottom of the gutter. If you have looked into this before, you may have read that a kitchen sponge, a roofing shingle, or artificial turf stuffed in there can help. Here’s the thing, it may do the job, but you’re going to end up with other problems (like stuff growing in there). There are specially designed foam inserts that will allow a smooth transition of the water. They’re designed to keep the water flowing but get rid of the sound. Maybe you’re sick of your downspout all together. Perhaps, a fancy chain might be better. Get rid of the enclosed downspout, and upgrade to a rusted chain that provides a unique look, but still transfers the water to the ground. They look cool, and they get the job done. There are many different styles: chains, cups, figures, and more that can let the water flow. Perhaps the idea of a chain just wouldn’t suit the style that you’re going for. Instead, you can still use the chain to help guide the water, but have it go through the downspout. Attach the chain to the top, the same way you would if you got rid of the downspout, and then let it hang down through the downspout. The water will follow the chain, but the noise will be dampened. It’s cheaper too since you don’t need a fancy chain when nobody will see it. Our metal expertise doesn’t end at the roof. We can provide you with a high quality metal roof, one that is going to last for decades, and get gutters to match. If all you need are the gutters, we do those too. 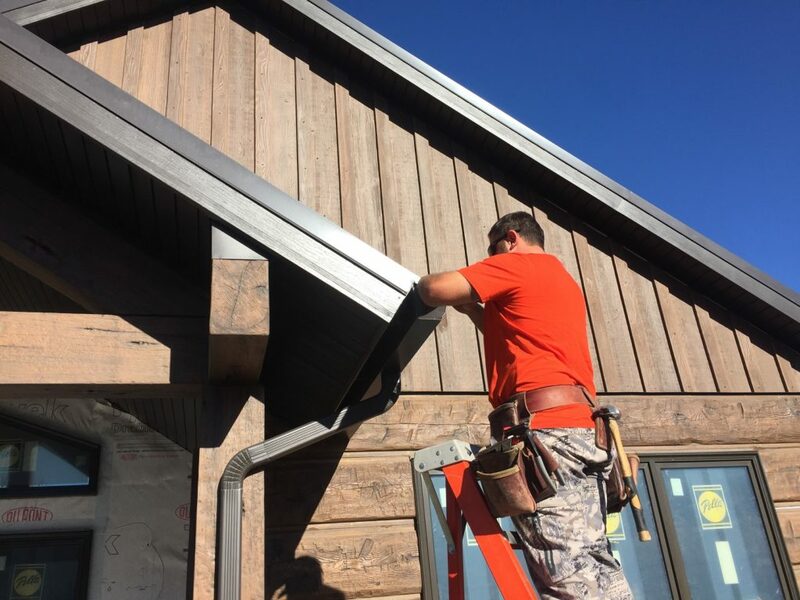 If your gutters need repairs, upgrades, replaced, or modified, give us a call at 406-839-0084 and we’ll figure out a time to come get your home looking great.